This month is a busy one in video games. First, December 7th was The Video Game Awards. And on December 9th it will be The PlayStation Experience. 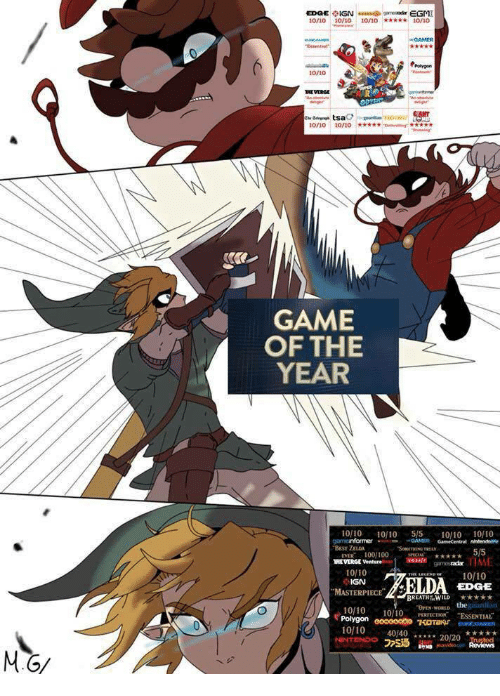 But first, what are the Game Awards? The Game Awards recognizes and upholds creative and technical excellence in the global video game industry. They bring together a diverse group of game players, game developers, and notable names from popular culture to celebrate and advance gaming’s position as the most immersive, challenging and inspiring form of entertainment. The Awards ceremony, held annually in December, celebrates both game creators and game players, and gives fans a sneak preview of games set to be released in the future. The program is broadcast globally, free-of-charge, on all gaming screens and digital platforms, and recognizes video games across PC, mobile, console, VR/AR, and also eSports. To continue the MHW talk, here are some changes coming to the game. No loading screens between areas in a map, making it a more cohesive and seamless environment. Multiple base camps have been added to each location, which you can use to fast travel between areas. You can now cook and eat during a quest. In older games you could only do these things before starting a new quest. Now at the base camp you can change your equipment and armor in the middle of the quest, no longer are you locked into just one set of armors and weapons. No longer do you need to use Paint Bombs to mark a monster to make it easier to track, as they have introduced the Tracking Bugs. The game has a built in in-game wiki. Basically you no longer need to go to Wikipedia, or sites like Kiranico, to see what kind of weapon does the most damage to a certain monster, or what drops do certain monsters give. This is unlocked by slaying or capturing monsters. There is also Drop In and Out Multiplayer. You can invite a friend back to hunt if the lag-out. There is no longer a difference between Offline Single Player Quests and Online Multiplayer Quests. There will be new Language options, including Monster Hunter Gibberish. They have added a feature where at the end of a hunt it will show the contributions of each hunter. Fast gathering, you no longer have to stop to pick up a mushroom. You can essentially run by and press the action button and pick up whatever item you went for. You also no longer have to stop to drink potions, meaning you can run for your life and have a nice Potion as a Rathalos is chasing you. If there is no monster trying to make you its next meal, you do not have a stamina bar. Infinite running anyone? Also a cool feature, you have a net that you can shoot to capture bugs. Also no longer will you have to find fishing spots, you can fish in any body of water. Egg Quest are back, but you can roll with the egg without breaking! No longer do you have to guess how much Sharpness you have left on your weapon, it will show you on screen. You can now see damage numbers. This can be turned on and off. It now displays what move you can do next on the upper right corner. This will be so good for people who have lots of use weapons with many movesets, like the Hunting Horn. Traps are the environment. Kick the electric frog! There is also now a training area, where you can practice with a weapon and see if you like it. Blademasters and Gunners have the same Armor appearance. No longer will there be Negative Armor Skills, as all the armor pieces give you a skill of some sort. You can preview and “try-out” armors before you buy them. Fashion Souls anyone? You can set a wish list to track what materials you need for your desired armor set. You can see a weapons family tree at the smithy. Reverse Upgrading/Downgrading weapons will give you materials back. Yoshi’s real name is T. Yoshisaur Munchakoopas. Nintendo was forced to ship the Super Nintendo during night hours due to fear of being robbed by the Yakuza. Charles Martinet, the Voice of Mario, also Voices the Dragon Paarthurnax in Skyrim. This month I will speak about a game that was announced at E3 2017, back in June. That game is Monster Hunter World. Monster Hunter World (I will refer to it as MHW) is the newest iteration of the Monster Hunter role-playing games. As the title says, you are a hunter of monsters. In these games you are usually an unnamed character who comes upon some type of disaster. In MHW you are part of an expedition team, researching a new continent referred to as New World. Your main base of operations is called Astera. It provides all the amenities you’ll need to venture into this new continent with native monsters who roam the land. You are a researcher studying these new beasts. But don’t think you are a weak human, after all, you are a monster hunter. 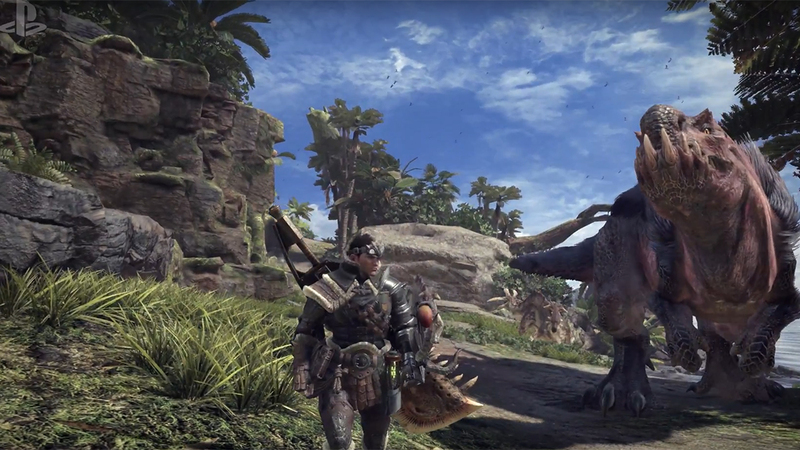 Monster Hunter equips you with 14 weapon types, all with different play styles and looks. Weapons are broken down into Close Range and Long Range. The close range weapons are Great Swords, Long Swords, Sword & Shield, Dual Blades, Hammer, Hunting Horn, Lance, Gunlance, Switch Axe, Insect Glaive, and Charge Blade; while the long ranged weapons are Light Bowgun, Heavy Bowgun, and Bow. The weapons themselves are categorized into Blunt or Cutting weapons. And the weapons themselves can have elements attached to them, like fire and ice. Also Status effects like poison and sleep. Weapons are not the only thing you get, you also get Armor. Now you may wonder, how do I get cool weapons and armor? The best way possible: Hunting. You slay these monsters and carve them for materials. You can also go around the maps and harvest various materials for other items like potions for healing and traps to capture monsters. Unlike older monster hunter games, the map is fully open. There are no loading zones, meaning there are fewer hiding spots when a monster is chasing you to take a bite outta you. It is the largest map to date in the series. So far they have introduced three map locations: The Ancient Forest, a lush forest; Wildspire Waste, a rocky desert; and a new archetype of location called The Coral Highlands, a dried up coral reef. There are so many Monster Hunter World details that I cannot fit it into this one article. 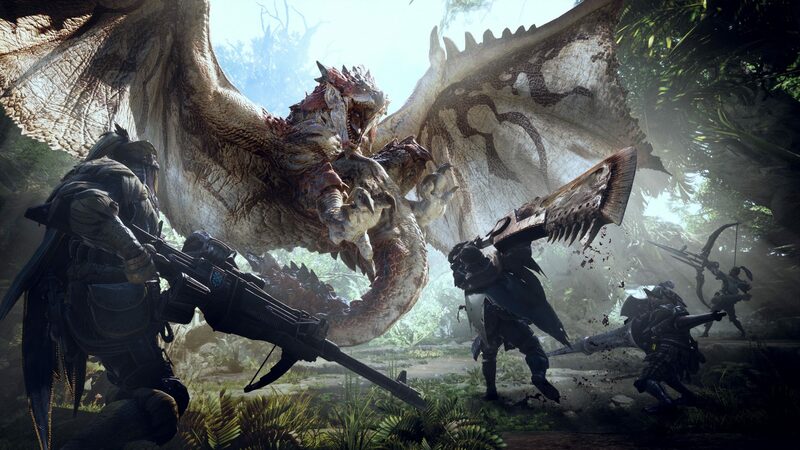 Therefore next month I will go into more detail on how the game works, new features, how weapons and armors work, and of course, just wouldn’t be Monster Hunter without the monsters. The bushes and clouds in Super Mario Bros. for the NES are the same thing, just different colors. Chromosome 7, responsible for ensuring human limbs and organs grow where they are supposed to, is called SHH - Sonic Hedgehog. In Super Mario 64, Boo’s laugh is actually a sped up version of Bowser’s laugh. Another week long gaming convention was held from August 22nd until August 26th. This was Gamescom which was held in Cologne, Germany. Many things were revealed or expanded on from what was shown at E3 2017. On the Microsoft front, they unveiled the Xbox One X Scorpio Edition. And they opened up the pre-orders for the Xbox One X, or as I call it XBOX. There are now more than 100 Xbox One upgraded games, which means that older Xbox One games will play even better on the XBOX. New Trailers for Middle-Earth Shadow of War and Assassin’s Creed Origin were released. Sea of Thieves was announced to have cross-platform play between PC and Xbox One. Age of Empires IV was announced, as well as a remastering of Age of Empires II and III. Nintendo also revealed some new stuff. A new stage for Super Mario Odyssey, called Luncheon Kingdom. Pokemon Ultra Sun and Ultra Moon Pre-Orders have opened. The remastered Pokemon Gold and Silver packaged pre-orders are available. Super Mario 3D Land, Luigi's Mansion 2, and Kirby Triple Deluxe have all been added under the Nintendo Selects banner. Fire Emblem Warriors is going to be released for the 3DS and the Switch in the Fall, and it has a new trailer. Metroid Samus Returns has a new trailer, and it’s gorgeous. The 3DS is getting an SNES inspired console, but only for Japan and Europe, we in the West don’t get anything. Bungie released the launch trailer for Destiny 2, and it looks great. Shenmue 3 was given a trailer and it looks, bad. Many fans are not happy with the way the trailer looks. Some compared it to early PS3 graphics. Gran Turismo is getting a 1TB PS4 Slim being released October 18th for Europe, UK and Australia. Star Wars Battlefront 2 had a trailer showcasing full on space battles. The Sims 4 is coming to the PS4 and Xbox One in November. Fallout VR and Doom VR have received release dates of December 12th and December 1st, respectively. The city simulation game Anno 1800 was announced, to be released Winter of 2018. The best-selling consoles of all time are the PlayStation 2 and Nintendo DS, both tied with about 155 million units sold. The maximum score anyone can achieve in Pac-Man is 3333360. Super Mario’s last name is also Mario, making his full name Mario Mario. Final Fantasy got its name from the fact that it was supposed to be Square's last ever game. They were struggling to become popular with dodgy games like Rad Racer and World Runner 3D, and were going to bow out of the industry gracefully. Hey all, this time around I will be talking about a game that really hyped me up and that is Destiny 2. The Destiny 2 Beta ran from July 18th until July 25th. The Beta showcased new subclasses: the Titan’s Sentinel, which can be explained as Captain America; Warlock’s Dawnblade, which lets you sprout Flame Clad wings and a fiery sword and lets you fly and rain hellfire upon your enemies; and the Hunter’s Arc Strider, which gives you a lightning staff and lets you move with great agility. 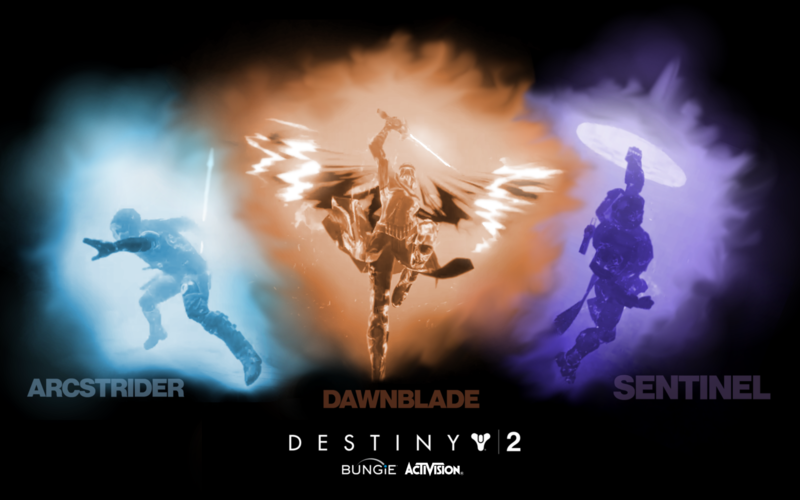 They all have their uses and specialties, with the Titan being the shield, Warlock the healer, and the Hunter as the Vanguard. I played the Beta as all the characters and for sure I will be playing as a Hunter. There is also a new PvP (Player vs Player) Mode called Countdown, which is basically Search and Destroy. 2 Teams of 4. 1 Team attacks. 1 Team Defends. The attackers must place a bomb at one of two locations and survive. This mode is something crazy. If you try in to play by yourself and get teamed up with random people, you might not have fun. The game mode needs communication. I played it a few times solo and I can say that I lost every single game. Then later on I played it with 3 other friends and we did not lose a match. Teamwork is key to success. There was a new Strike called The Inverted Spire. Strikes are essentially a mission. With 3 players and at the end there’s a boss. And Loot. There’s always loot. In the Strike you had one objective. Stop the Cabal, an enemy alien race, from drilling to the center on a Vex, another enemy faction, think Terminators, World called Nessus. At the end you fight a 3 phase boss battle against a Vex called Protheon. In all the Beta to me was a success. There were small issues but that’s what Betas are for. To test out a build of a new game and see what needs to be changed. Destiny 2 releases September 6th for Playstation 4 and Xbox One and later on in October for PC. Thanks largely - we hope - to being bundled with a Wiimote, Wii Play has sold around twice as much as Halo 3, shifting some 16 million copies. The Metroid series doesn’t take place in any kind of order, so the plot can be confusing. Chronologically, Samus’ adventures take place as so: Metroid (NES), Metroid Prime (GC), Metroid 2: Return Of Samus (Game Boy), Super Metroid (SNES) and Metroid Fusion (GBA). Make sense now? This June was a highly eventful time for gamers everywhere. The Electronic Entertainment Expo, or E3, was held from June 10th to June 14th. E3 is essentially the Oscars of video games. Any and all of the major video gaming publishers and developer companies come together to show off what new games and consoles they have been working on. I will give a small recap of new things that came from this year's E3. A pretty impressive console for sure. Another big announcement was the backwards compatibility all the way back to the Original Xbox. Noteworthy Xbox Exclusive games are Sea of Thieves, Anthem, Forza Motorsports 7, Crackdown 3, and State of Decay 2. Sony’s Conference was slightly lackluster. They did not reveal any new consoles but they did show off plenty of games. The big ones are Uncharted: Lost Legacy, Days Gone, Horizon Zero Dawn: The Frozen Wastes Expansion, Monster Hunter World, Shadow of the Colossus H, God of War, and Spider-Man. Last but not least Nintendo ended the conferences in a very Nintendo way. They didn’t announce any hardware as their latest console, Nintendo Switch, just released back in March. They started out in a very mellow Nintendo way. Talking about some games that were already announced, such as Arms, Pokken DX and Mario Odyssey. But things got crazy when they announced Rocket League for the Switch, a new Yoshi game, new Kirby game, Metroid Prime 4, and a core Pokemon Game for the Switch. Here’s a some of the upcoming games from Nintendo: Arms, Pokken Tournament DX, Mario Odyssey, Metroid Prime 4, Fire Emblem Warriors, Legend of Zelda BoTW Expansions, Skyrim for the Switch, and Metroid Samus Returns for 3DS. In my opinion, Nintendo won E3 overall. Mega Man is known as Rock Man in Japan. This was changed in America because "rock" is well-known slang for crack cocaine, and the name stuck. The Original Devil May Cry was originally intended to be the next chapter in the Resident Evil series. The gun juggle move was a glitch, but became part of Dante's moveset. Final Fantasy VII was originally designed for the Nintendo 64, but Square cancelled the project and moved the project the PSone because of the lack of space in the console's game cartridges. FFVII would've filled 13 cartridges.